A ribbon "clothesline" with baby items, attached by tiny colorful clothespins, is not only a great guest activity, it's a great baby shower keepsake! 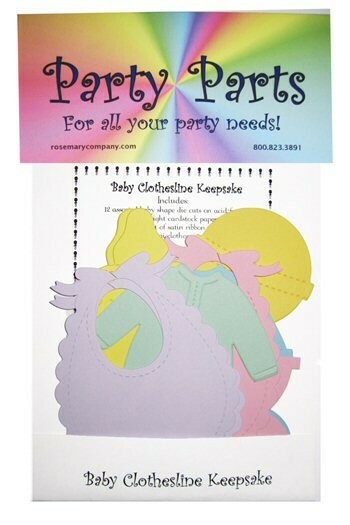 Each package comes with assorted baby shape die cut cards, yellow ribbon, and baby size clothespins. Guests will write a note to the baby or advice to the Mom-to-be on the shaped cards, clip them to the ribbon with the clothespins, and create an adorable banner for the Baby Shower. 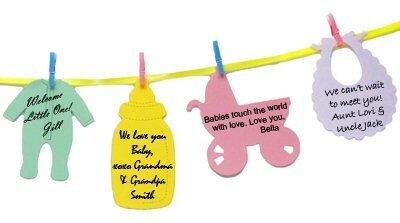 It can later be hung in the nursery, or saved in a scrapbook. You can send the die cut cards out with the baby shower invitations and have guests bring them to the shower or just hand guests a cute cut out, a baby design pen, and a clothes pin, when they get to the shower. Use your imagination to create a unique, fun, and touching activity everyone will enjoy and cherish.